Combine sliced onion and mushrooms in a medium bowl. In a large bowl, stir together ground beef, breadcrumbs, ground mustard, beef bouillon, ketchup, balsamic vinegar and salt and pepper to taste until well combined. Form mixture into 4 oblong, flattened patties. Heat a large (preferably cast-iron) skillet over medium-high heat. Add butter to melt. Add patties and cook 10 to 15 minutes, flipping occasionally, until no longer pink in the center. Transfer patties to a plate; drain excess grease from skillet. Reduce heat to medium. Add onion-mushroom mixture and saute 5 minutes until mixture is soft and onions are golden brown. Add beef broth, ketchup and balsamic vinegar; stir. Whisk in cornstarch to thicken and reduce gravy. When gravy is fully thickened (about 5 minutes), return steaks to pan and spoon gravy over the tops. Cook another 2 to 3 minutes until steaks are warmed through. Serve immediately. Did you eat TV dinners growing up? They were my FAVE as a kid. I couldn’t get enough of that hockey puck of salty goodness known as Salisbury steak, along with a perfectly round helping of mashed potatoes and a spoonful of sweet peas. Oh, and don’t forget the jelly-like cherry “cobbler”! SO YUM. I hope not – because I’m here to tell you it’s possible to make your own TV dinner at home, with fewer funky ingredients and a lot more flavor. Say hey to Homemade Salisbury Steak, y’all! First, combine all the ingredients for the steak in a large bowl. What makes the steak Salisbury-y, you ask? It could be a magical formula, or it could have something to do with breadcrumbs, dry mustard, balsamic vinegar and ketchup. Hard to say. 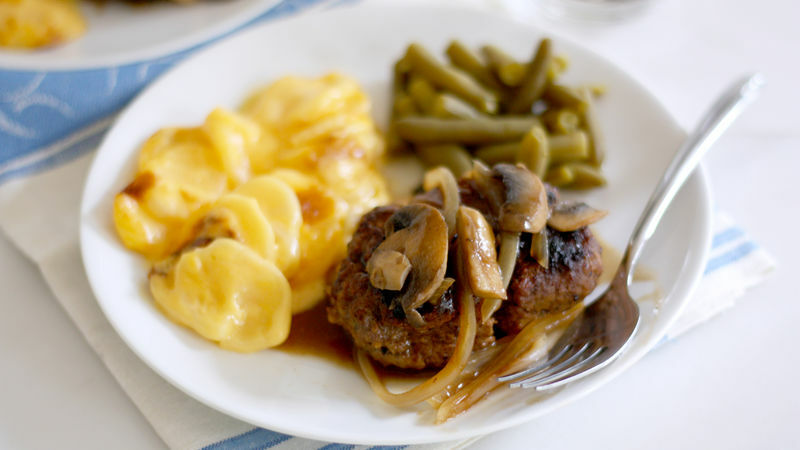 Form the mixture into four oblong, flattened patties, and cook them in a well-buttered skillet for a few minutes until they’re no longer pink in the center. You’ll want a decent char on the outside because when the steaks meld with the gravy we’re going to make, it makes this amazing crunchy/glazy texture on the outside of the steaks that… well, it sounds kinda gross, actually, but I promise you it’s OH-SO-GOOD. ANYWAY, transfer the cooked steak to a plate, drain the excess grease from the pan and sauté some ‘shrooms and onions until they’re soft and golden brown. Add some beef broth, more balsamic vinegar and ketchup and a wee bit o’ cornstarch to make the gravy. Mmmm, gravy. I love it. Once the gravy has thickened and reduced, add the steaks back to the skillet and spoon the gravy over the top (this is when that amazing crunchy/glazy texture thang happens!). Leave the steaks in the skillet until they’re warmed through again. Finally, serve them up with some green beans or peas and Betty Crocker’s Ultimate Au Gratin Potatoes (SO much tastier than the mashies from the TV dinner box, if you ask me). Like I said, winner, winner TV din – oh, let’s just eat already! Stephanie (aka Girl Versus Dough) can’t talk right now – she’s about to swan dive into that gravy. Check out Stephanie’s Tablespoon member profile and keep checking back for her own personal recipes on Tablespoon!